Fill a saucepan with water and heat on high until boiling. Add noodles to boiling water and continue cooking on high, stirring occasionally. Cook until tender (about 10 minutes). While pasta cooks, mix chicken broth with cornstarch. Heat in a saucepan on medium high heat. Place brown and serve rolls on a baking sheet and place in hot oven. Chop broccoli and add to saucepan with chicken broth. Stir. 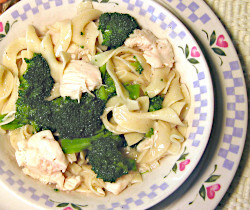 Drain canned chicken and add to saucepan with broth and broccoli. Stir. Drain and rinse pasta. Set aside. Continue cooking sauce until it reaches the desired thickness. Add noodles and stir to coat. Turn heat to low and continue stirring until noodles are warm.